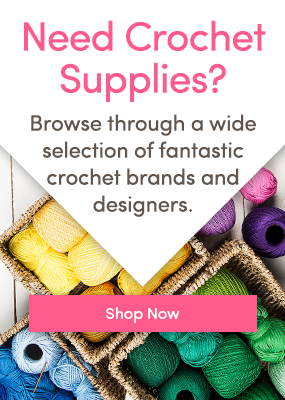 Hi, we are Kat and Joanne of The Crochet Project and we’d love to help you learn to crochet. Between the two of us we’ve taught hundreds of people to crochet in classes up and down the UK (and abroad). The more you teach beginners the more you see the different areas that people struggle with and which simple tips can be shared to overcome them. In our latest book, “The Learn to Crochet Project” we want to give you the same feeling of being in class, to give you the same level of information imparted in a friendly way, distilling all the teaching experience we’ve gained. We’ve teamed up with LoveCrochet.com to bring you this blog series which takes the most vital information from the book to give you a little taster of crochet and a hand to get going with a Facebook Crochet Along (CAL) group so that you have the support you need to master the skills and make some new crochet buddies along the way. We are going to teach you the basic crochet stitches to help you make a lovely neck-warming cowl next week and then we will teach you about following patterns and making things that fit. It may feel awkward at first. Your hand isn’t used to making the shapes you are asking it to make and you’ve not wielded a hook before. This can be especially true if you are a knitter as some people feel they should have some affinity with another yarn craft, but the movements and techniques are different and sometimes counter-intuitive to what you are used to. Be patient and persevere. You will get there. It can be tricky to see where you are going when you begin. First stitches can be too tight or too loose and it can be difficult to know where to place your hook. One of your first tasks when learning to crochet is learning to “read” the stitches so you know where to go next. You will develop an eye for it, but it does take a bit of practice. Sadly, the bit we have to teach you first is the most difficult part you have to learn. Resist the urge to throw it across the room and keep going. It gets easier, we promise. There are no crochet police! As long as you are happy with your finished pieces then it is all good. No one is going to come and check whether you held the hook a certain way, no one is going to inspect that slightly wonky edge before you hid it behind a pretty border. Unfortunately for English speaking crocheters, there are two standards for written patterns: Standard UK terminology and Standard US terminology. This blog series is going to be run in UK terminology – don’t worry if you are based in the US or like a US crochet designer or blogger, once you’ve learnt the basic stitches its going to be very easy to translate them. But until you have mastered the stitches it is least confusing to pick one system and stick with it. The yarn and hook you choose to learn with can make or break your early experiences. Paramount is having a yarn in which you can clearly see each stitch and that moves easily and freely as you work. Choose a yarn that isn’t fluffy, has a little give when pressed and doesn’t fall into separate strands too quickly when rolled between your fingers. Choose a solid colour that isn’t too light, too dark or too bright. Anything in pure cotton. They have no bounce, they split like nobody’s business and they don’t flow easily against themselves. Most pure acrylics. They are quite sticky in nature and don’t glide freely against each other, they are also a little bit fluffy making stitches harder to see. Anything free on the front of a magazine. Yes even if it was on a magazine promising to teach you to knit/crochet! I can’t tell you the number of times we see these yarns at classes and it almost always makes it harder to learn than necessary. The hook should be smooth, free from snags and feel comfortable when held. So lets get you started. Watch these videos for making a chain and working your first stitches into the chain and making your second row. Grab a hook and yarn and have a play! If you prefer to learn from a step by step tutorial then you can buy it in print here. We’ll be back next week with instructional videos for half treble and treble crochet stitches and the how to for making your very first piece of crochet clothing! Yes you will be making yourself a lovely cowl to keep the chills of your neck! Join the chatter, get help and share your thrills and frustrations over in our Facebook group for the CAL. Get yourself signed up ready for the crochet-along to start in earnest on 8th January 2018. And don’t forget to sign up to the newsletter so you don’t miss out on any of this Learn To Crochet series. The Crochet Project is a design and publishing partnership between two friends, Kat Goldin and Joanne Scrace. With a shared love of making beautiful wearable crochet and skill sets that complement each other, the partnership helps us both to bring out the best in our design work. Together we publish books and pat­terns and run retreats. We both teach crochet regularly in our local area and sometimes at festivals and yarn shops around the country. Kat is based on a farm, half rural idyll, half mad house in Scotland at the edge of the Trussocks national park, Joanne lives on the edge of the very flat fens near Cambridge. Things would probably be easier if we lived closer but we make do with a lot of texting back and forth, the odd phone call and late night chatting when we get together for yarn festivals and events! 12 Responses to Learn to Crochet with The Crochet Project CAL! I am left handed also. I had a hard time learning because my mom tried to teach me but she was right handed. I took a class and the instructor told me to look in the mirror in front of her and others whom were right handed to look at her. That did it, I have been crocheting for nine years now. I did have an advantage, my mom had shown me how to read the patterns. Hang in there you will get it!! I’m a beginner and I tougt my left handed friend over video chat I just told her to do it the other way round to me if I go clockwise she goes anticlockwise like a mirror image she got the hang of it in 3 days. Do you have beginning tutorial videos for left-handed people? As an instructor myself we are taught to teach left handed people to crochet right handed. I know, it makes little sense but that is what is recommended. If it still doesn’t feel right, try the videos at moogly.com she tends to do videos for most basic stitches both left and right handed. Hope this helps. Can’t wait as I am really struggling but keen to learn! I have been crocheting for over 30 years and am self taught. I remember about a year after I got married we were transferred overseas. First time away from home, one year old and nothing to do. So…I got me a mirror and sat down with hook and yarn and a book I had borrowed from the base library. Just remember when you are crocheting left handed your pattern will turn out fine, albeit may be backwards but I have never had a flop. Our second tour I made layettes for the Airman’s Attic. Probably did 30 or more. Keep it it up. Don’t give up. hello: what is the name/pattern for the navy shawl in the above picture? (in the photo at the top of this page it has hand warmers, hat, etc. in the photo… but I would like to make the shawl. Thank you in advance. I am allergic to wool. Any other suggestions for yarn? Hi to get a yarn closest to the beginners yarn recommended in this blog which is easy to crotchet with go for alpaca. It’s very low allergy and shouldn’t make you itch. It’s a bit more pricey but very good quality. A cheap but lovely brand is the Drops alpaca range. It is worth trying wool mixes though eg wool mix will silk or acrylic and some superwash wools have been treated which makes them less itchy. I think they have less lanolin. Hello, I am bedbound and don’t use those things. can I just use my own wool instead of paying all that money for something I am not going to wear, please? I only learnt to do a granny square years ago and cannot make anything. I have a big problem keeping the wool/yarn on my finger without getting longer and longer. Thank you very very much, Michelle Dixon.